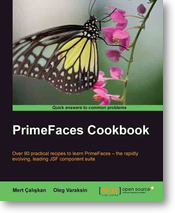 PrimeFaces Cookbook was published today. The book writing was a piece of a hard work and I'm happy to finish it. The next method shows the approach. To get an URL for the interested JAR file, we need to know any Java class in this JAR file. This can be a marker interface or any other interface, abstract class as well. Obtained Class object can be passed into the method along with the library name. As I said, supporting of two URL protocols, vfs and file, was enough for me to get it working on all modern app. servers. The main goal of this method is collecting VirtualFile instances below a certain folder. VirtualFile allows to get other infos such as size, name, path, whether the object is a file or directory, etc. It allows to get children und provides many other traversal operations. For the file protocol, we have to mount the archive file in the Virtual File System (like in UNIX). Once mounted, the archive structure is accessible like a normal file system. The call virtualFile.getChild("/META-INF/resources/" + libraryName).getChildren() returns all children (VirtualFile instances) below our /META-INF/resources/com/foo/. We iterate through and collect resource (file) names. PrimeFaces Extensions is now more social than ever. The project has been successfully migrated to GitHub. Please visit our new Homepage. You will find there all links, to the showcase, new issue tracker, wiki, daily builds, etc. Please only use the new infrastructure on the GitHub (especially for issues). After the next main release, we will delete the old, deprecated infrastructure on the google code completely. I would like to thanks Nilesh Mali and Thomas Andraschko that helped me a lot during migration. We could migrate all sub-projects with the whole commits history since the project exists. An overview of existing sub-projects can be found here. We would like to invite everyone to participate in the PrimeFaces Extensions. Please feel free to create issues and feature requests. Feel also free to initiate Pull Requests. We will review and accept all reasonable suggestions and patches. This is a true open source project!